Safe To Eat | Safe, because it’s delicious. We have moved to The Food Spot! Please update your links to http://www.thefoodspot.com. Those of you using feeds you canpoint them to http://www.thefoodspot.com/feed/. All the old posts are transferred, so everything here will still be accessible, just on the new site. More features are being added (recipe index, searches, etc.). Thanks for coming to this site and reading. See you at The Food Spot. The recipe looked easy, simple, and quick–and it was–but, boy, was I anxious about how these would turn out. I think it’s because I expected something a bit more involved and was caught off guard when the work was finished in less than five minutes. In the end, they tasted great and were one of the easiest meals I have made. Not all my dumplings were picture-perfect, but they sure tasted great. Why did it cause me problems? Well, click through to find out. I was flying blind. Not only had I never made dumplings before, but I could also not remember ever having them before. I had no idea how they were supposed to cook or what they were supposed to look like. I was still tired and a bit under the weather, so I skipped my usual research for new recipes. I just chose the recipe from How to Cook Everything that was next to the chicken soup. They were fine, it turns out I can follow instructions. Bring the 6 cups chicken stock to a simmer. In a mixing bowl, mash the butter with a fork until soft and creamy. Add the eggs and mix until combined (it’s fine if it doesn’t get completely incorporated). Add the rest of the ingredients (salt and pepper to your liking). Add any other herbs you like (I added about 1/2 teaspoon of Herbs en Provence). The dough will still be creamy, don’t worry, it’s fine. Measure out about teaspoon sized amounts and, using another spoon or your fingers, scoop it out into the simmering broth. Try to keep the dough together or you will end up with some oddly shaped dumplings, as I did. Simmer for 10 minutes. Serve with chicken soup. A few days ago I mentioned that I made a chicken soup. I highly reccomend making your own stock for this. It’s neither hard nor particularly difficult to make your own stock. And because I was a bit under the weather when I made this particular version, I took extra pains to make sure it was easy. Once you make your own, you’ll realize that it is much better than any of the dozen or so of the brands offered at the supermarket. Sure, one or two may be serviceable, but making it yourself is truly stunning. 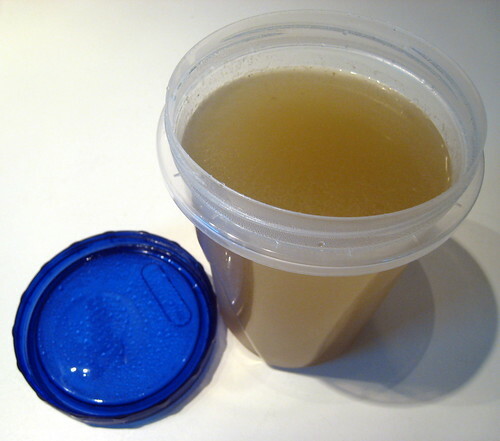 Interested in making the simplest chicken stock? Click through to find out how. Whether you are trying to chase off the cold or a cold, a Hot Toddy will solve your problems. 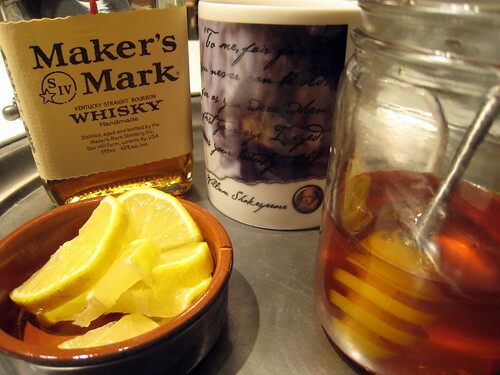 It is combination of lemons, hot liquid and alcohol commonly used as a sore throat/cold remedy. Naturally, I used it in conjunction with my chicken soup as part of my cold cure. A hot toddy in the making. A couple of these and you will be set for a night of sleep. Check after the jump for the recipe and more pics. Over the weekend I was tired, I didn’t feel very good, and my throat hurt. I didn’t want to cook anything complicated. But I wanted something classic and nutritious to help me feel better. I looked in my pantry and found some orzo. I had some chicken stock, a couple carrots, and some celery on hand too. After standing around feeling sorry for myself for a while, I realized that was all I needed. Put all that in a pot and what do you get? 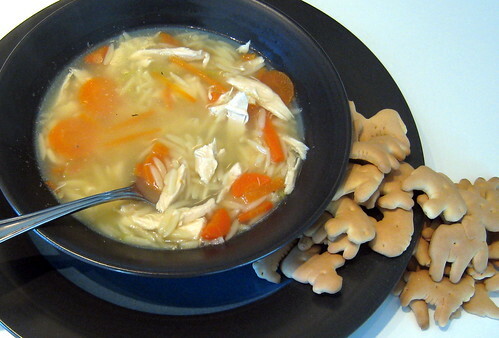 Chicken soup! That should help me get back on my feet. The I-dont-feel-so-good, easy, chicken soup. Ohhh, and animal crackers… Yeah, animal crackers… I think I’ll be just fine. Click through for the soup recipe. Apart from the shape, there is really only one difference between these and the french fries: Fry them once at the high temperature and not twice. Like most fried food, these are best fresh. I can’t really tell you how they are the next day as there are typically none left. Several months ago I posted about making potato chips in the microwave. You can quickly get your snack on with that method, but it doesn’t quite match the fresh-out-of-the-fryer taste. The microwave chips had some benifits: arguably a bit crunchier, harder to burn the chip (and yourself), and less mess. 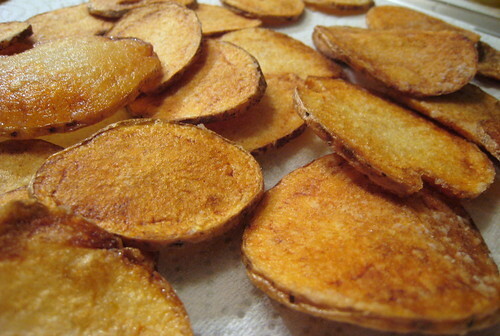 If you are looking to make chips for one or two, use your microwave. If you want chips for 5 or more, deep frying them is the way to go. A few weeks ago I posted that I came across the Peanut M&M Bunny Mix and, after devouring a bag, I wondered if M&M’s made any different kinds of Easter themed mixes. I should have never doubted them, in another grocery store this weekend, I came across two more: regular M&M’s Bunny Mix, and Easter Eggs! It’s pretty cute that they print sheep, rabbits, and ducks on the regular ones, but the Easter Eggs blow my mind on many levels. I’m going to stock up on the Easter Eggs while they are in season because they will be sorely missed until next Easter. 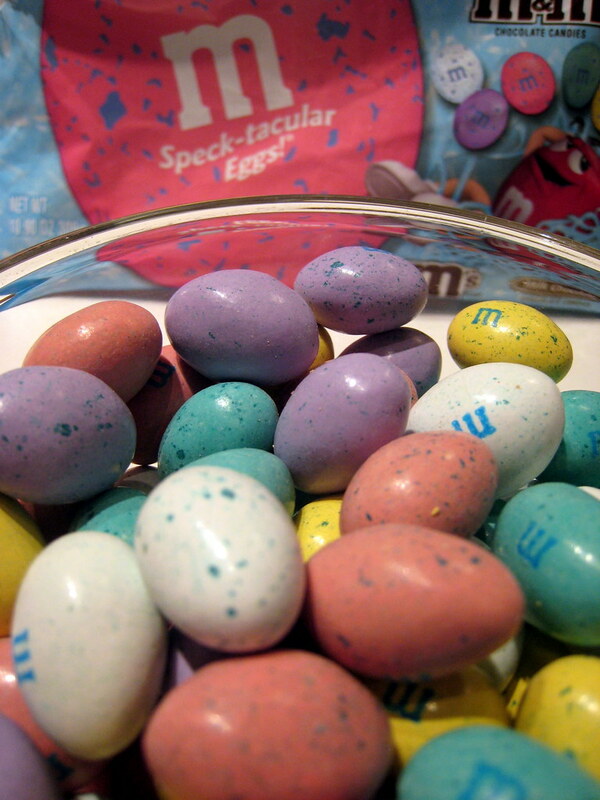 Click though for a detailed analysis of the awesomeness hidden in the M&M Easter Eggs. Thanks for visiting! We have moved to www.thefoodspot.com. Check there for all these posts and more tasty news! Go The Food Spot!